rodeasdown.com.au – At last… the truth about second-hand violins. Maybe you don’t know much about violins, but I’m willing to bet a dollar you know enough about them to answer the following two questions. Question one: What’s the most valuable type of violin in the world? Question two: What’s the best sounding type of violin in the world? And I’m willing to bet another dollar your answer to both questions is the same; Stradivarius. If so you’re wrong on both counts. The most valuable violin in the world ain’t a Strad, it’s Vieuxtemps Guarneri. It was made in the 18th century in Cremona, Italy, and it was sold to an anonymous buyer in 2012 for $US16 million, enough in Australian dollars to buy a couple of three-by-one houses in outer Melbourne or an inner-city terrace in Sydney (needs work). Violins built by members of the Guarneri family and their Cremonese neighbours, the Stradivari and the Amati families, regularly sell in the seven and eight-figure range because musicians value them so highly for their sound quality, and the secret of that special sound is one of music’s continuing mysteries, although I once read a detailed report suggesting it was all about the glue. American violinist Anne Akiko Meyers is one such musician and whoever that buyer of the $16 million number was, he or she was so impressed by Meyer’s talent that he or she presented it to her for a lifelong loan. I would have taken the 16 mill. Ah, but there is now solid and growing evidence suggesting modern violins sound just as good, maybe even better. And if that’s so what’s the point of paying $16 million for a second-hand one? Studies by Claudia Fritz, a flautist and musical acoustics researcher at the Pierre and Marie Curie University in Paris, and Joseph Curtin, a violin maker in Michigan USA, have shown that professional violinists wearing goggles that prevent them clearly seeing the instrument they are playing can’t tell the difference between a Cremonese masterpiece and a well-made modern offering, and they generally prefer the sound of the latter. And a study recently presented in the heavyweight scientific journal Proceedings of the National Academy of Sciences suggests the same is true of audiences. Please note that a violin made by Joseph Curtin is not exactly cheap. Yehudi Menuhin has one, so does Ruggiero Ricci. Indeed in 2013 one of Ricci’s violins bearing Curtin’s name set a world record at auction for a violin made by someone who is still living. The price, however, was somewhat less than $16 million. Actually it was $US132,000, or less than one one-hundred-and-twentieth the price of the Guarneri. Curtin may have an axe to grind, but he does have a point. He and Fritz conducted experiments in concert halls in Paris and New York in which matched pairs of instruments, one old and one new in each pair, were put against one-another in a series of tests, some solo and others with an accompanying orchestra, and the goggles were used to prevent the players knowing which instrument was which. The audience view of the players was blocked by acoustically transparent screens. And this was not just any old audience, it was made up of other musicians, critics and composers. In both places audiences and musicians agreed that the new instruments had better sound projection than the old ones. In New York the audience was asked which instruments it preferred and those folk nominated the new one even though, like the players, the testing suggested they really couldn’t tell with any accuracy which was which. 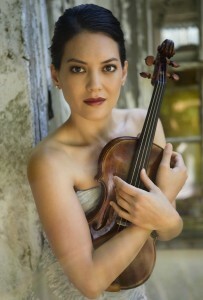 Ms Meyers is unlikely to abandon her Guarneri as a result of all this. After all it’s working for her just as hard as she’s working for it. But for all those other violinists who do not have unknown benefactors presenting them with instruments costing $16 million it does provide the reassuring knowledge that one day, if they sit up straight and eat all their greens they can sound just as good as her. Okay, it’s time to come clean. Raising this whole issue is an excuse for me to tell one of my favourite jokes. While cleaning out his recently deceased grandfather’s loft a guy discovers an old violin and a beautiful original painting of water lilies. So he takes them down to his mate at Sothebys who promises to call him back with a valuation. And when the guy gets the call the good news is that he has an original Monet and an original Stradivari.